Are you a free spirit? A bit of a hippy with a love of all things au naturel? Perhaps you’re a sucker for cute illustration and elegant design? 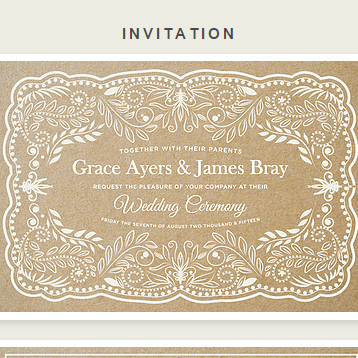 If this sounds like you, you’ve come across the perfect wedding invitation! The gorgeous Boho Mojo collection from The Invite Guy is one of understated style, ideal for a range of wedding celebrations from beach nuptials and church weddings to barn parties and moroccan tent festivals. Featuring some of the most beautifully dainty illustrations we have seen, Boho Mojo’s unique design reminds us of an intricate henna design. Tiny leaves, neat borders and unusual patterns make this design take on an air of elegance and natural beauty, perfectly mixed with a subtle boho vibe. It’s a simple design but it’s no doubt still as memorable and interesting as some of the bolder and brighter designs out there. If you think this design would be perfect with a splash of colour, you’re in luck! This wedding collection is completely customisable, so if your wedding theme features blue tones or orange hues we can wave our magic wand and make your wish come true by adding your design colour palette into the mix. Similarly, if you find you’d like to tweak the wording or change the type of paper stock we can do that too! Cute and compact as an A5 size invitation, every inch of Boho Mojo is on-trend and oh-so sassy! You can add a Boho Mojo vibe to every aspect of your wedding celebrations thanks to the extensive products in this range. Tags: Bohemian, Pretty, Rustic, Unique.